Image: Archie Comics. Cover art by Robert Hack. Excellent news! Sabrina the Teenage Witch is making her way to television again, in a new show from the creative team behind Archie Comics’ other TV adaptation, Riverdale. Even better news: this is not your childhood Sabrina. It’s the version from the outstanding horror comic Chilling Adventures of Sabrina, a book you should absolutely read. Born out of the Archie Comics resurgence that first gave us not just the excellent Archie reboot but the likewise excellent Afterlife with Archie zombie series, Roberto Aguirre-Sacasa and Robert Hack’s Chilling Adventures of Sabrina gives us (on an intermittent schedule, unfortunately) a Sabrina that, at first glance, was unlike anything the company had done before—and definitely unlike what most people were familiar with through the weird and wonderful Melissa Joan Hart show. The Sabrina most people were used to in the pages of her past Archie books was a witch, sure, but her magical abilities skewed on the lighter side of things, using her powers to gain advantages against her aunts or to get a leg up at school, tricks and cantrips in the background of where the real drama was in any Archie book: highschool romance. Chilling Adventures, just like Afterlife before it, went in the opposite direction, with Sabrina’s nature as a witch a much more crucial aspect of the series. Not just in the presence of magic, because Chilling Adventures is about the kind of witch that prefers naked, bloody pacts with Satan rather than floppy hats and broomsticks. The series starts dark—literally with Sabrina’s mom being driven mad by her Warlock father, after she attempts to take her mortal baby daughter away to avoid her being inducted into the dark arts Edward Spellman has been embroiled in for years—and gets darker, introducing the reader to an intense magical world of demons and moral greyness. None of the characters you’re used with from other incarnations are safe from being taken down a much darker path, even if their roles in Sabrina’s story are still familiar, whether its Aunts Zelda and Hilda or even Sabrina’s on-off boyfriend Harvey. Sabrina herself isn’t portrayed in a sympathetic light, either, joining her aunts in sinful rituals and using her magics to harm and even dominate the minds of her fellow teenagers. The Sabrina of Chilling Adventures loves being a witch as much as her previous incarnations, but with everything ramped up to 11 when it comes to the guts and gore of the book’s traditional horror take on witchcraft, the fact she’s so gung-ho becomes horrifying rather than heroic. The almost-absurdity of just how dark Chilling Adventures can be, and all the classic horror tropes it envelops itself in, wouldn’t work without Hack’s art going all-in either. The series’ ‘60s setting lets Hack’s sketchy, loose style sing, its hard contrast giving the brutal nature of Sabrina’s life as a witch an even harder edge. The color work, sepia tones with the occasional pop of bright, isolated color (usually blood red, if we’re honest), lends the whole thing a vibe that feels ripped right out of the pulp horror comic covers of the period, whether it’s used in scenes of Sabrina’s home-life being taught the ways of Witchcraft, or when she’s at her “normal” school in Greendale trying to live the life of a teenage girl... who just so happens to have bloody, horrifying supernatural powers. And really, that’s what makes Chilling Adventures of Sabrina work. For all the darkness and depravity of its supernatural side—and it really is a shockingly grim endeavor at times—the series is still true to what people have loved about Sabrina in all forms for decades before it. The framing is still there, the characters are still there, albeit in twisted forms (sure, Hilda and Zelda occasionally partake in a bit of gore-laden cannibalism, but they’re still goofy yet loving guardians to Sabrina). All the things that drove the drama of the previous incarnations—Sabrina pondering whether to embrace or give up her magical side, the push and pull between her high school life and her home life—is still in play, it just has a darker heart underlying it all. As a horror comic, Chilling Adventures can be as intense and gutwrenching as some of the best work on shelves right now. But what makes it shine is that it’s all that, while still being Sabrina’s journey through teenage life. The absurdity of how, at the surface, it seems so wildly different balancing with the at times camp familiarity of the Sabrina we know and love is a precarious balance, but just like Afterlife with Archie before it, Aguirre-Sacasa and Hack strike that balance perfectly. 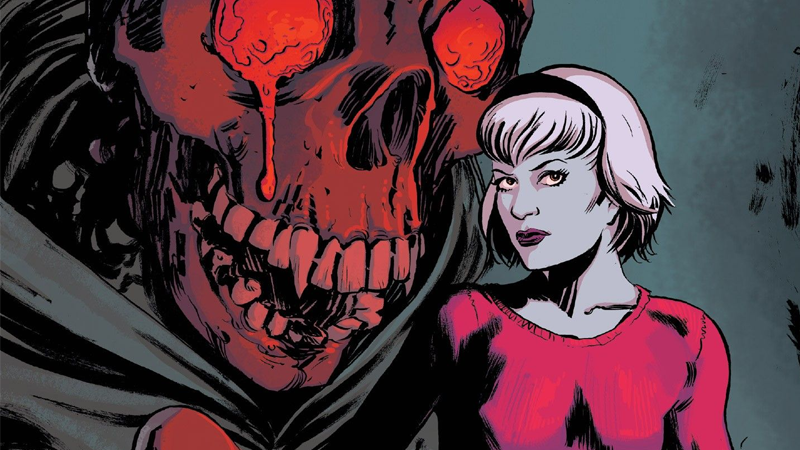 There’s no other horror comic like Sabrina, the sort of book can make you laugh in a moment of otherwise sheer, gruesome terror—and we can’t wait to see its heady mix of devilish horror and teenage life to get translated to TV.